One of the most undervalued nonprofit transparency best practices is to use online reviews. 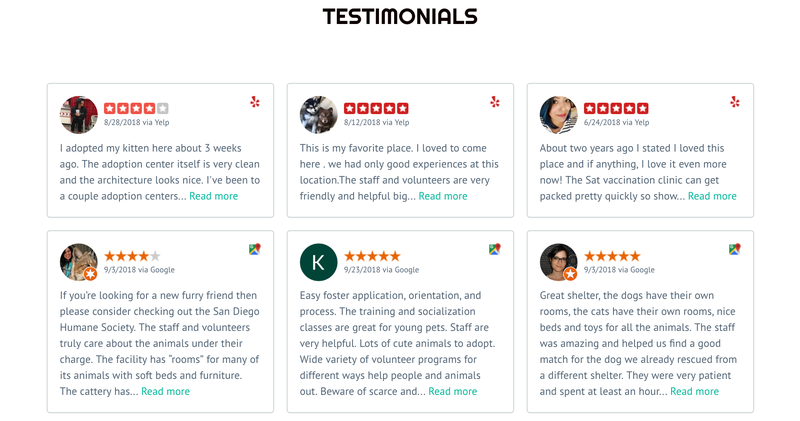 We want to change that, so we dug deep into the value of reviews for nonprofits. Nonprofit organizations have many of the same challenges as for-profit businesses. They compete for consumer income with other nonprofits and for-profits. In some cases, they even compete for clientele. Donors have full discretion in how they choose to give: both in where they send their dollars and how much money they send. A nonprofit organization’s website should inspire confidence in how they serve their cause as well as how their donor gifts are used. Nonprofit organizations need to differentiate themselves from their competition. One of the ways to do that is by highlighting reviews and testimonials from happy clients and donors. Last week on Give Live, I was joined by Jay Buys, CEO of Visceral, a B-Corporation specializing in social marketing and growth for non-profits and organizations working for good. Watch the video below for the full conversation and read on about the value of reviews. When it comes to discretionary income, most people are selective about where they spend their money. Donations could just as easily end up as a personal expenditure for the would-be donor as they could a donation. Perhaps the donor would rather spend that money on a new purse, fishing rod, or vacation. If the donor is intent on giving, as so many generous people are, then they have a wide range of nonprofit organizations to choose from, all of which would be willing recipients of those funds. How should they choose where to give? What factors go into that decision? Personal experience/affinity with a cause: A person chooses to donate to an organization because they have used their services, know a friend or family member who has benefited from the organization, or have volunteered with the organization. Perceived need: The organization is thoughtful in how they show their needs and demonstrates why donations are important and what they will be used for. They do this while appearing healthy, as donors seldom want to donate to what is perceived as a lost cause. Availability and attention: Potential donors need to see the opportunity to give on a regular basis. This may be done through appeal letters, social media, or email newsletters. The goal is keeping the organization at the top of a potential donor’s mind. Recommendation: Others associated with the donor recommend the nonprofit organization for either services or donations. Word of mouth is powerful marketing. Reputation: The organization is known for being trustworthy, useful, and ethical. Donors can feel secure in that their donation is used well by an organization in which they can place their confidence. The nonprofit organization that can provide each of the first four factors will positively influence the fifth. Your reputation is determined by the perceived need of your cause, the availability to respond to it, and what others say and feel about your organization. All of these components, especially your reputation, are reflected through reviews and testimonials. By collecting as many kinds of stories and recommendations as possible, you will open up new opportunities to boost the transparency and credibility of your organization, two factors that inspire donors to give to a particular cause. How Can a Nonprofit Benefit from Reviews? Most nonprofit organizations have media accounts where clients and donors can rate and review them. Some examples are websites like Facebook, Google My Business, and Yelp. Many might also provide the ability on their website to leave testimonials, as well as collect comment cards, letters and emails through personal interactions. Reviews are not only helpful in helping a shopper determine what car to buy and from which dealer, but also in helping a donor determine where to send their donations. Ask for them. Use social media, your newsletter, and other interactions with clients and volunteers to ask for their input and to rate/review their experiences with you. Provide online links for them to complete reviews on Facebook, Yelp, Google, and your website. If they are at your physical location, give them a way to provide feedback in writing. You can type those into your website as testimonials/reviews later on. Share them. Use great reviews as a way to promote your organization. Tweet them. Post them on Facebook, Instagram, and other social platforms. Highlight them in your newsletter. There’s also a great tool that Google provides for their own reviews to share Google Reviews called Small Thanks with Google that will beautifully format reviews into social media friendly formats. Aggregate them on your website. Showcase your amazing reviews. Add them to your Donation Page. Provide more social proof that giving to your cause is worth it. Reviews only help gather donations if you make sure people see them. A great review is a morale booster. It helps with team building. It’s a moment to celebrate. But while a great review creates a definite feel-good moment for your organization when you read it, that doesn’t tell others why they should donate to you. Make sure you share it, too. Your organization isn’t just vying for donations. It’s looking to provide services to those in need. You may be the only organization that does what you do for 100 miles in any direction, but you may also be one of many. For example, you could be one of many animal shelters in a metro area. How you treat your animals, what your location looks like, and how you treat pet adopters matters to those looking to donate and adopt or foster animals. 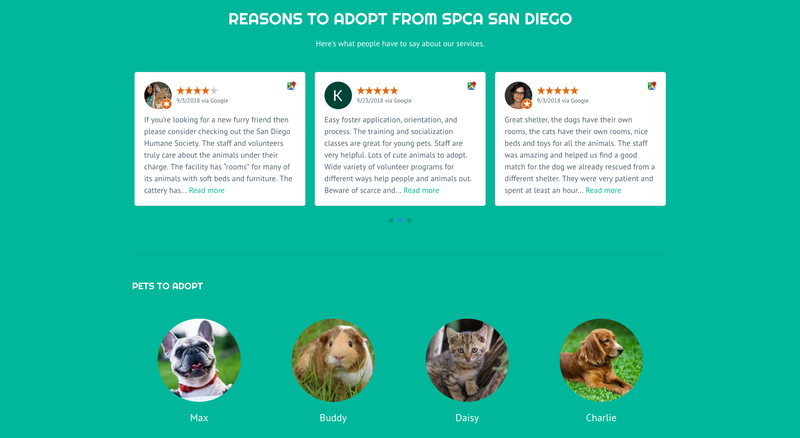 Showcasing reviews of those who have volunteered, adopted, or donated at your shelter matters. It influences how people make decisions on where to go. There are a few different ways you can display reviews on your website. Retype them into your website on a testimonial/review page. Style them yourself. Set them up in a list, or if you’re using a page builder (like Divi, Beaver Builder, or Elementor), use one of the modules to create a different layout. While this can be labor intensive, it is certainly an option. Create links to the reviews on other platforms. Have a place on your site that links to your Google review, Facebook recommendation, or Yelp review. This option requires that your site visitor be willing to click an external link to read your reviews. This is a less effective way to share reviews on your site. Use a reviews plugin to aggregate and display reviews on your site. Plugins (like WP Business Reviews) connect directly to your review sites to import them to your website for you, style them to your choosing, and display them attractively on your site. One of the additional benefits of displaying your organization’s reviews on your site is the added SEO (Search Engine Optimization) value. Text on your site is used for organic SEO, and positive reviews will go far in helping provide that text. For more explanation about how your reviews can benefit your SEO, read this article from WP Business Reviews. By implementing a plugin like WP Business Reviews, you can use the user-generated keyword-rich content to boost your SEO efforts and provide transparency and credibility for your organization all at once. Try putting all your positive reviews on one page and keep an up-to-date aggregate review wall. An alternative is to divide out your reviews by the type of reviewer. Maybe you will have a volunteer, a donor, and a cause beneficiary (or client) sections. Using your reviews from other platforms on your website will speak volumes for the credibility of your organization. Ultimately, organizations thrive not only on donations but on reputation as well. Your reviews help with both. Show your site visitors how good you are – not only by telling your own story but by allowing the reviews of others to tell it, too. 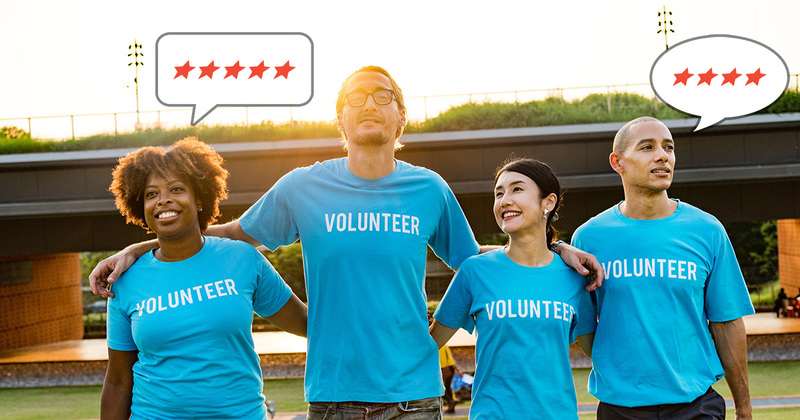 Provide social proof of your success and trustworthiness by displaying your reviews and testimonials on your site, highlighting them in your social media, and using them in your fundraising campaigns. Using a plugin like WP Business Reviews makes it easier to allow others to sing your praises and display them beautifully on your site.